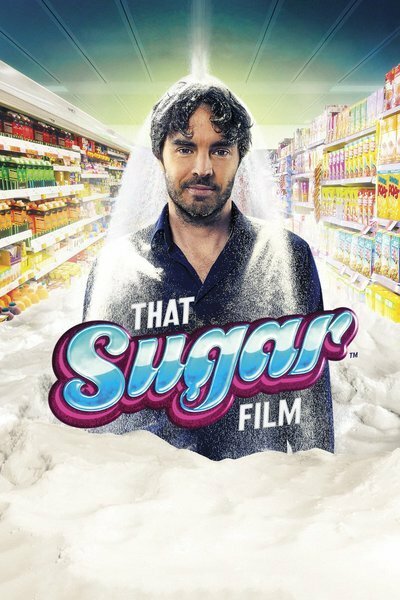 What the Oscar-nominated documentary “Super Size Me” was to the fast-food industry, “That Sugar Film” endeavors to be for businesses that are invested in refined sugar, a nearly unavoidable additive in the majority of processed edibles on grocery shelves. In fact, the claim is made that if you removed all sugar-containing items from a typical store, only 20 percent of the stock would remain. But instead of a dude’s dude like Morgan Spurlock chowing down on All-American fries, burgers and plus-size soft drinks packed with empty calories to gauge the effects of a McDonald’s-only diet, this cautionary saga about the horrors of sweeteners features laidback Aussie actor Damon Gameau in the role of director, interviewer and on-camera guinea pig. Back in 2004, the idea that a filmmaker would risk his own well-being by voluntarily only eating garbage for an entire month was quite novel. The popular expose could have possibly been one of the factors that led Mickey D’s to eventually add a few healthier alternatives to its menu. Whether or not the doc also raised awareness among the general public about how such chains contribute to the country’s obesity crisis is another question. But “Super Size Me” also trafficked in a less edifying kind of carny cinema: Ladies and gentlemen, come watch a man try to eat himself to death. The formerly fit Spurlock would gain 24 pounds, see his body mass index and cholesterol levels soar, suffer from mood swings and lethargy, and accumulate fat in his liver. A decade later, much of the shock value has dissipated from observing such a nutritionally induced sideshow. That may be why the initially wiry Gameau, a 30-something-ish cross between comic Russell Brand and Bret McKenzie of "Flight of the Conchords," feels the need to jazz up matters in a rather fanciful and intermittently entertaining fashion. Gameau occasionally shrinks himself down to Ant-Man size, at one point hanging by a rope from his own nose before traveling through his body “Fantastic Voyage”-style. Talking heads show up on food labels, street signs and Times Square billboards. Pop songs such as Depeche Mode’s “Just Can’t Get Enough” add a bouncy component. Brit wit Stephen Fry elucidates the difference between glucose, lactose, sucrose and fructose in rhyme. An unbilled Hugh Jackman does some hocus pocus with visual aids concocted with sugar granules on a lit-up podium to illustrate the history of the substance. Did you know Queen Elizabeth I was a sugar fiend whose teeth rotted and turned black? Well, now you do. Gameau himself also shows a penchant for walking about in neon yellow or orange underpants during his medical check-ups. It’s all very cute, but if you want sugar-drenched whimsy, why not indulge in “Willy Wonka & the Chocolate Factory” instead? The handling of the dietary experiment doesn’t vary all that much from Spurlock’s overall approach as Gameau prepares to spend two months ingesting 40 teaspoons of sugar a day—what the average Australian takes in. He consults doctors, nutritionists and other experts before subjecting himself to such a regimen since he has been sugar-free for the past five years, thanks to the influence of his girlfriend. The one interesting twist: instead of feasting on fistfuls of jelly beans, mounds of ice cream and piles of Oreos, his intake of sweets comes entirely from supposedly healthy products such as cereal, sports drinks, smoothies, baked beans and juices. It's sort of like when “Seinfeld’s” Elaine questioned whether all that the delicious frozen yogurt at a new neighborhood shop was actually non-fat. Unlike Spurlock, however, Gameau has a personal reason behind his main impetus for doing the doc. His first child is due in three months. That is why much of what he ingests is often considered good-for-you kid snacks. But many of the damaging effects are the same, including the acquisition of a pot belly, a lack of energy, a decreased attention span, moodiness and an insatiable craving for the next sugar high. One interesting fact that comes out of Gameau’s self-abusing ordeal is that even though he has been eating the same number of daily calories—a normal 2,300—as he did before, he has packed on 15 pounds mostly around his waist. His acquisition of a dad-bod physique might suggest that all calories are not created equal and that certain sources might affect the body more aversely, something sugar manufacturers with a vested interest vehemently deny. Gameau also inserts a bit of journalism into the mix with two road trips that elevate "That Sugar Film" beyond a semi-vanity production. He travels to Amata, an aboriginal community of 350 citizens in remote northern Australia. Together, the population consumes 40,000 liters of soft drinks each year—thanks in part to easy access to Coca-Cola and a lack of fresh produce at the local food store—with debilitating and deadly results. Matters do improve when a government-supported program provides better alternatives. That is, until funding is cut. But anyone who likes to regularly say “yahoo” to a Mountain Dew might change their mind once they witness the devastating effects of an epidemic outbreak of “Mountain Dew mouth”—the result of guzzling five or six cans of this sugar and caffeine-loaded beverage every day—in a rural Kentucky town. A teen named Larry, a Dew devotee whose teeth look like they have been drenched in acid, desperately wants to get dentures. But his dentist can’t complete the tooth-pulling procedure, seen in excruciating detail, since his gums are so infected that the pain killers won’t work. As for Larry’s mystifying revelation that he will continue to drink Mountain Dew even after he gets his false teeth, it says more about the insidious nature of sugar than anything that Gameau can offer.